The definition of purpose for a Bow is simple; It is a man made implement capable of sending a pointed shaft with force, a greater distance than it could be throw by hand and thus increases the 'killing distance'. Or put another way, 'Projecting a missile with force and some degree of accuracy'. 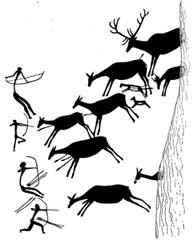 Applied either to hunting or for military purposes, the person using the bow (an Archer or Bowman) has a distinct advantage over a spear, sword or axe, and has a greater distance and more accuracy than a sling-shot used for throwing stones. Early cave paintings, dating back thousands of years to the Neolithic period, prove that this formidable weapon has featured throughout the development of mankind and is linked inexplicably to the success of the human race. "And God was with the boy, and he grew up. He lived in the wilderness and became an expert with the bow". The chances are certain; if you are English, European, North American Indian, Asian, Japanese, in fact any Nationality other than a native Aborigine (who are known to have used boomerangs but never bows) then one of your forefathers or ancestors was certain to have used a bow. It is in your blood, and your make up; The two bones in your left forearm, the Radius and Ulna, could possibly be 1 to 2mm thicker in diameter than your right forearms bones; for it is a medical fact that many men, especially Englishmen, are thought to have become genetically modified after 30,000 years, or even longer, of 'shooting in the bow'. Military strategists, commanders and generals throughout the ages, all recognized the the importance of the Bow as a 'weapon of mass destruction' and none more so than the Kings of England. Archery was hugely popular in the UK both as a pursuit, sport - hunting for meat, rabbit and small game, supposedly excluding boar and deer in the Royal Forests of England, and could be a shortcut to riches - a groat (4d) up to 6d a day and the chance to a share of 'ransoms and spoils of war' for any Archer good enough to be called up ('the posse comitatus') for military campaigns, especially against our old adversary, French! Practice at 'the butts', usually located near the local parish Church, which was the centre of most social activity during medieval times, was initially a voluntary occurrence in all English & Welsh towns and villages as men, young and old, would test their bow kills at regular weekly meetings. Then in the late 1470 - someone invented an early form of what we might call cricket and in 1477 Edward IV found it necessary to ban this game because it began interfering with regular archery practice. Kick ball or foot ball. Two teams would race about kicking a bundle of bound up leather between two sticks, placed two at each end of a field. (Not incidentally between two gate posts, as gates in fields rarely existed until the much later 'enclosures acts' of the 18th century, as is sometimes claimed as the origin of the game of football). This new football game wasn't actually banned, though it was tried to be discouraged 'as it was considered to entice vile and loutish behavior' (no comment here!) and in 1515 King Henry VIII passed a new law, to try maintain Archery as the predominant and preferred sport. Item: Whether the Kinges subjectes, not lame nor having no lawfull impediment, and beinge within the age of XI yeares, excepte Spiritual men, Justices etc. and Barons of the Exchequer, use shoting on longe bowes, and have bowe continually in his house, to use himself and that fathers and governours of chyldren teache them to shote, and that bowes and arrowes be bought for chyldren under XVII and above VII yere, by him that has such a chylde in his house, and the Maister maye stoppe it againe of his wages, and after that age he to provideb them himselfe: and who that is founde in defaute, in not having bowes and arrowes by the space of a moneth, to forfayte xiid.. And boyers for everie bowe of ewe, to make two of Elme wiche or othere wood of meane price, and if thei be founde to doe the contrarie, to be committed to warde, by the space of viii daies or more. And that buttes be made, in everie citie, towne and place accordinge to the law of auncient time used, and the inhabitantes and dwellers in everye of them to exercise themselfe with longe bowes in shotinge at the same, and elles wher on holy daies and other times conveniente. And that al bowstaves of ewe, be open and not solde in bundels nor close. And that no stranger not being denizen, shall convey oute of the kinges obeilance (?) anie bowes, arrowes, or shaftes without the kinges speciall license upon paine of forfaiture, and also imprysonment nor use shotynge in anie longe bowe without the kinges license, uppon paine to forfaite the bowes and arrowes to the kinges subjectes that will Seaze them. The Statute thereof is ANNO 6. H8. Cap:2. This Act has ever been repealed - so fathers ( or 'governors') with male children over the age of 7 - you face a fine if you have not provided them with a bow, two arrows and taught them how to shoot! "Shooting is an art necessary for the knowledge of all sorts of men, useful both in peace and war. It is an honest pastime for the mind, and an wholesome exercise for the Body, not vile for great men to use, nor costly for poor men to maintain, not lurking in holes and corners, for ill men at their pleasure to misuse it, but still abiding in the open fight and face of the world, for good men (if it be any way faulty) by their wisdom to correct it." In 1628/9 the 1515 Statute of Henry VIII requiring archery practice was reinforced and in 1633 Charles I issued yet another new order; for the use of bows in the Trained Bands, with training to be provided by a master bowman. Indeed, a new company of pikemen also armed with bows (the ‘double-armed man’) was formed in Herefordshire as late as in 1642. Henry VIII started a number of sporting archery groups – protecting them against prosecution from accidentally shooting with 'ye bowe and arrowe' anyone unfortunate enough to be passing by! This was termed as 'The King's Pardon'. It is extremely doubtful that 'The Kings Pardon' still applies today!